Clearly, there are a lot of people who feel that the economic recovery-over five years old by now, at least by the official count-isn't reaching them. That's a central result from a pretty gloomy poll out today from Rutgers University. 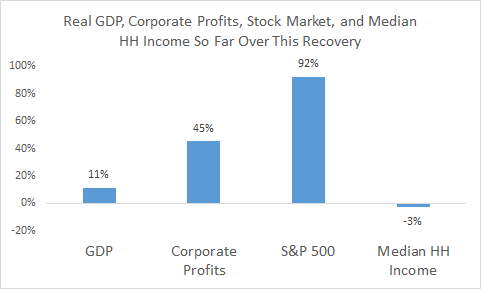 I put some thoughts and data together over at PostEverything, showing the gaps between real GDP growth, corporate profitability, the stock market, and middle-class household incomes. As you see, the disconnect kinda jumps out attcha. Sources: BEA, Standard and Poors, Sentier Research. 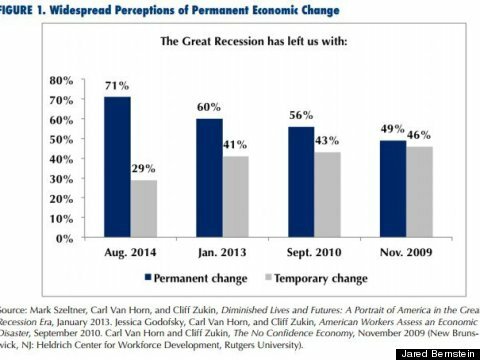 You never want to read too much into one poll, but OTEers will recall that this comports with recent economic findings that show precisely this phenomenon: the Great Recession did in fact do very significant damage to growth rates across the globe. One study by Larry Ball that I wrote up a few weeks ago found that the loss of potential output in the U.S. amounted to $7,500 per household. As I've noted elsewhere, I think some of the damage can be repaired, but it will takes numerous years at full employment if that is to happen.